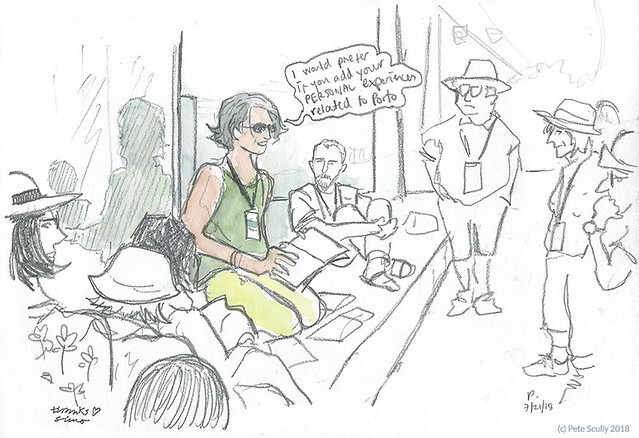 The second and final workshop I took was with Simonetta (Simo) Capecchi, from Naples. I met Simo at the 2010 Portland symposium, and took one of her workshops there (actually at that one I think I may have wandered off and lost track of time, if I recall), oops. I was super excited to take this one though, as I love Simo’s work and her ideas, and this workshop was called “One Page Says It All: A Reportage on Porto Wine”. Simo does a lot of reportage sketching for a travel magazine called “Dove” (it’s in Italian), so she has a lot of experience in commissions for travel reportages. The point of this workshop was to create a page about Porto wine – think of an angle, map out your page, and think up a catchy title. There wasn’t a lot of time to do a ton of research, so it was mostly looking through windows, mooching around the wineries (or their info stands and gift shops) at quick pace, browsing leaflets in the tourist office. Most of the time is spent sketching, but the text had to be important. 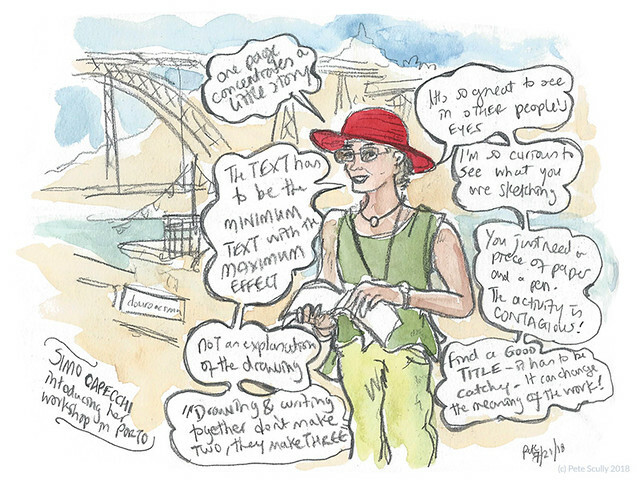 I sketched Simo above, before we took the little ferryboat over the Douro to our location in Vila Nova de Gaia. 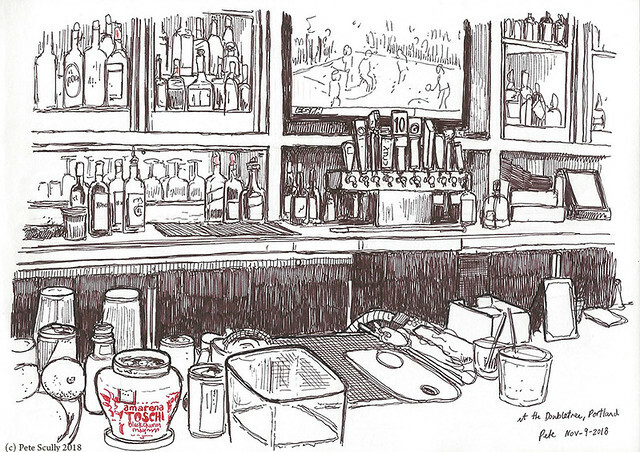 I liked the phrase “drawing and writing together don’t make two, they make three.” It’s so true. 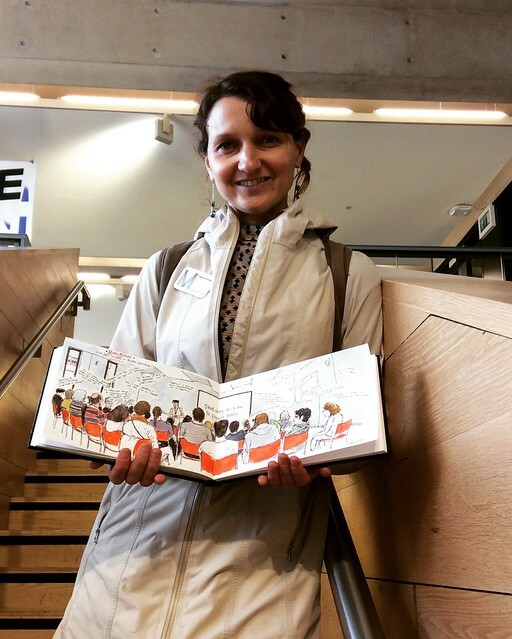 Here, Simo shows us some of her own reportage work, offering advice on how we can construct our pages. Some of the results of the various sketchers were very good, some highly detailed and well thought out, others a little more carefree, I think I fell into the latter a little. My page is below. 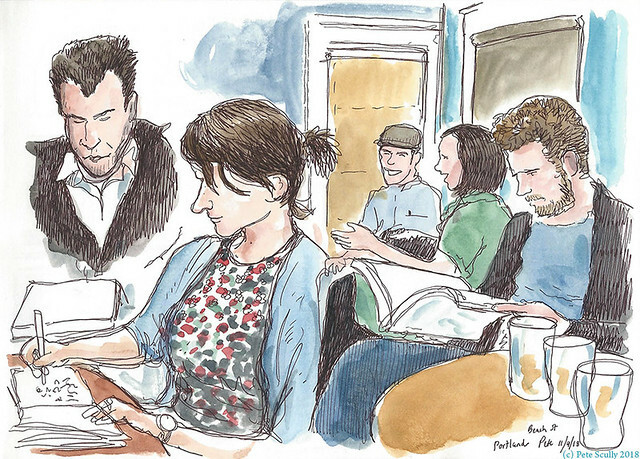 It’s drawn in the Clairefontaine sketchbook that came in our symposium goody bags. I focused on the old English names of all the Port wineries – many of them were founded by English vintners several hundred years ago (and Anglo-Portuguese relations do go back many centuries, to their alliance back in the middle ages, the longest standing alliance between nations). I rushed the title though, quickly adding it in just before the show and tell: “A Glass of Old England” (I then added “In Old Porto” and immediately regretted it). I didn’t like the title though. I should have called it “Going Out For An English” in reference to that classic Goodness Gracious Me sketch. I really enjoyed this workshop, Simo is a very interesting storyteller and has always been an inspiration to me, and going over the river and thinking about Porto wine was a very pleasant way to spend a morning. 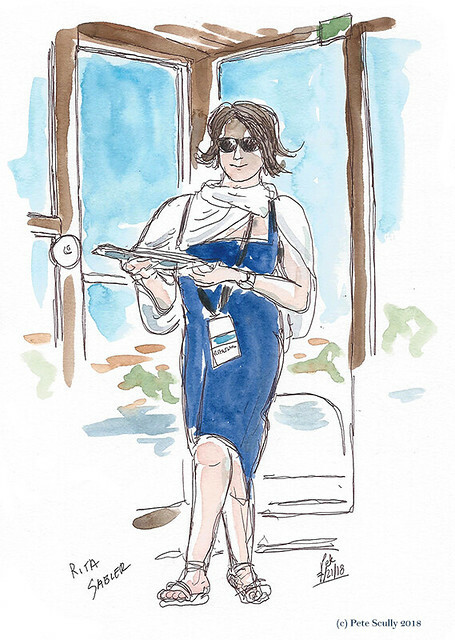 Below, sketched on the ferryboat back over the river, is my friend Rita Sabler, who was one of the official correspondents for the Porto symposium. 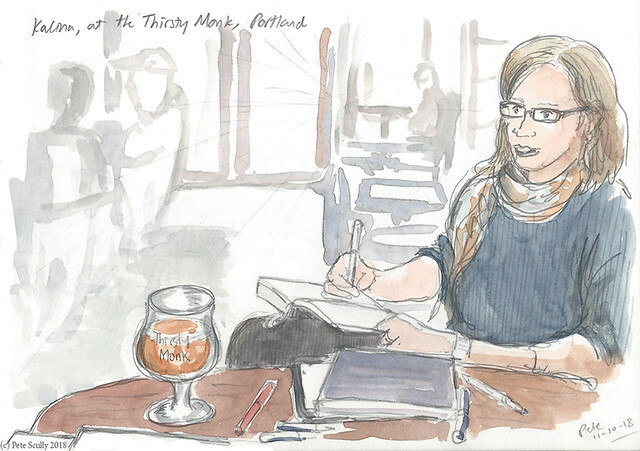 She had been sketching and reporting on our workshop. 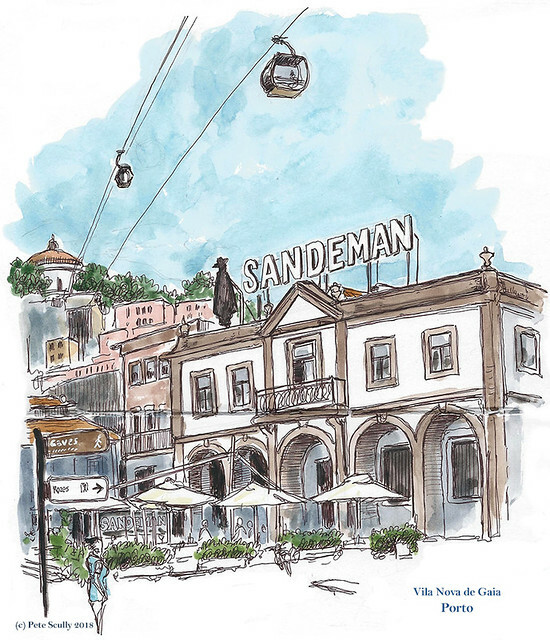 You can read her daily reports, along with those of the other two correspondents Paulo Mendes and Marina Grechanik, on the Urban Sketchers website. And finally, here is the sketch of Sandeman’s without all the writing and stuff around it. Those cable-cars above are part of the Teleferico de Gaia. I did not ride these but would have liked to, if I’d given myself the time. All this reportaging, you would have thought I’d have topped it off with a nice glass of tawny. Instead, I got myself something unusual: a gelato made from Port wine. It was actually delicious.